A Subway restaurant in Knoxville, Tennessee is now equipped with a product known as SelectaDNA, which aims to tag anyone who breaks in with an identifying spray containing a DNA code viewable only under ultraviolet light. The "intruder spray," as it is nicknamed, contains “a unique DNA code which can be used to uniquely mark and trace both items of property and criminals," according to its manufacturer, SelectaDNA. The spray's US distributor, Johan Larsen, told the Knoxville News-Sentinel that the product is already in use in Australia and Europe. 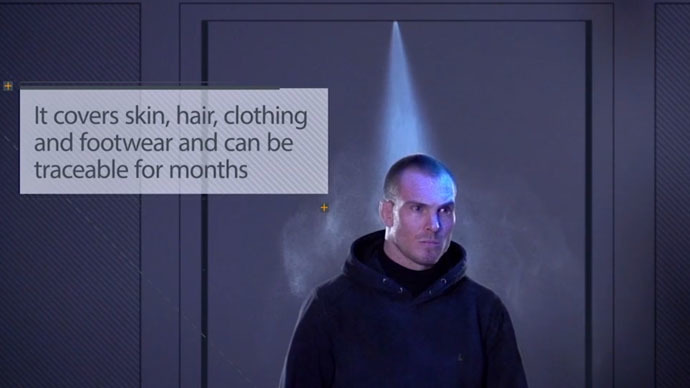 If not identified by ultraviolet light, a suspect's clothing, for example, could be tested to see if the spray's owner-specific synthetic DNA is a match. "SelectaDNA property markers contain thousands of microdots which allow police to identify property at the scene in a matter of seconds," acceding to the company's website. "UV tracers are incorporated in SelectaDNA to make it easy for police to find thieves who have been sprayed with SelectaDNA and property that has been marked." SelectaDNA also has an adhesive liquid product intended for home use that was given out in some Knoxville neighborhoods, the News-Sentinel reported. Home or property owners can register their personal SelectaDNA kits, making it easier to track their DNA liquid should a robbery take place. Other Subway restaurants are considering the spray as well, according to the News-Sentinel. According to its own website, SelectaDNA is "trusted by" the likes of McDonald's, Royal Bank of Scotland, Shell Oil, and pharmaceutical giant Glaxo Smith Kline.